The internet is absolutely overflowing with cute pictures and videos of odd couple animals who get along well and really seem to enjoy each other's company. While this can be adorable, it can be really dangerous as well, especially for our exotics! Many would be considered prey species for traditional pets, like dogs and cats, and this can make interactions between the two risky. While some combinations appear to tolerate each other well, others can be deadly. 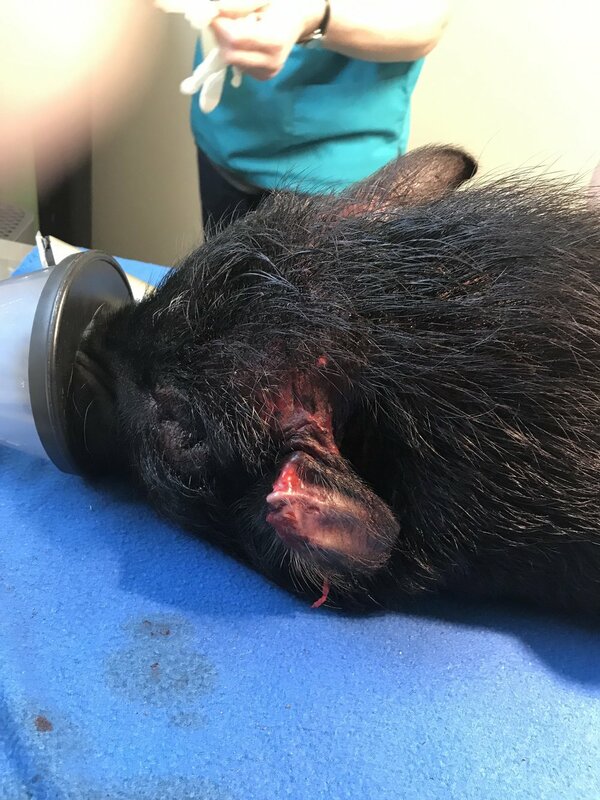 We regularly treat cat and dog bite injuries to rabbits, rodents, birds and even reptiles. Moondance's case shows some of the worst of what can happen. In this instance, it was an unfortunate accident that the pig and dog were together and was never intended. Luckily for Moondance, his owners were able to intervene quickly! Unfortunately, injuries to his head were so severe that he ended up losing his right ear. While injuries can happen when any pets get together, it’s especially risky when predators such as dogs, cats (and even ferrets) meet prey species. Even the behavior of pets that appeared to get along in the past can change very quickly. Always exercise care, and when you are not sure, be there to supervise! Newer PostTraveling tips for cold weather!